Red Oak, Hickory, Hard Maple and Cherry are always in-stock and readily available for for your handcrafted hardwood cabinets. We are also able to special order the raw materials of any other specie for you. 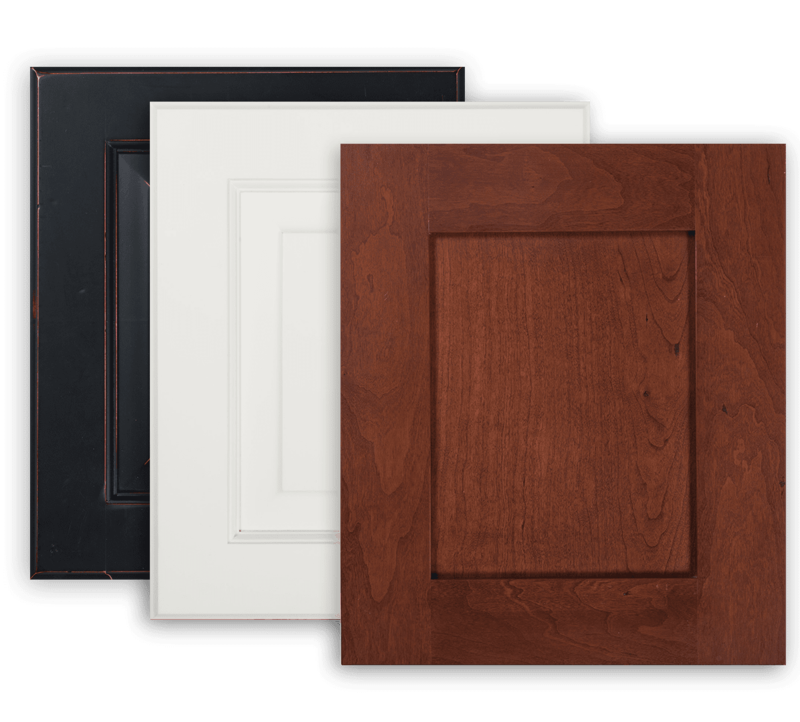 We have several cabinet door styles in both Raised Center Panels and Flat Center Panels. We also offer a unique design feature which allows you to design all components to truly fit your vision– here you can select from our center panel styles, pair it with any rail style– with your choice of outer rail edge profile. Doors and Drawer Fronts are offered in 4/4 (3/4”) or 5/4 (1”) thicknesses assembled using the stile and rail method. These high-quality doors can be overlay, inset or inset with beaded cabinet openings. Additionally, as you browse our door styles, you will notice that we finish in stains and paints along with premium techniques such as distress, glaze and rub thru. Our drawer boxes are made from maple and constructed using the dovetail method for excellent strength and durability. In addition to our handcrafted cabinets, we partner with countertop fabricators and sources for hardware to assist in making the perfect selections to complement your cabinets and express your personal style– this creates a seamless process in bringing your vision to life! *The flat panel may be ¼” Veneer Panel or a Beaded Panel.